"The founders didn't write the Constitution and Bill of Rights with all this bravado and confidence. They wrote those documents in fear. They had come, or their families had, from places where people that they knew were hung for speaking up for their rights." Award-winning filmmakers Annie Sundberg and Ricki Stern (The Devil Came On Horseback) have teamed with writer Naomi Wolf to paint an alarming message about the direction America is heading. The bad news is that it's not the right direction. 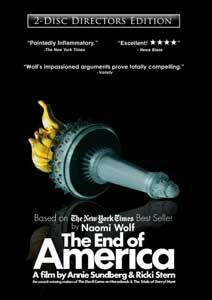 The result is the documentary The End of America, based on Wolf's book, and it looks at the post 9/11 eroding of many individual rights of U.S. citizens and a broadening of governmental power that appears to trampling willy-nilly on the Constitution in all sorts of deep, dark, and disturbing ways. It's all about power and control, and sadly none of it belongs to the people. Unlike the often polarizing antics of Michael Moore, Wolf takes a different tack; the high road, as it were. She presents her ideas in a town hall format, speaking to an audience about what she believes are the ten warning signs�she refers to it as a "blueprint"�that an open society is about to close up tight. And as she goes down her list over the course of 73 minutes, the parallels between dictatorships and fascism that Wolf presents are quite frightening, and she does so without resorting to wacky attempts at humor or confrontational attacks. She just goes for what she claims are the facts, citing subversion of individual rights and constitutional changes, providing news reports and interviews to reinforce her ideas, making her arguments about the loss of freedoms appear sound and logical. Through topics like generating fear, watch lists, Blackwater, and mass arrests, Wolf, Sundberg, and Stern point at the work of the Bush administration with an unwavering accusatory hand. They stress the dangerously loose verbiage of the Patriot Act, and how it allows the government more than just the power to go after what us ordinary folks perceive as the "bad guys," but the ability to target those very same average joes at will. The underlying message for the film V For Vendetta was "People should not be afraid of their governments. Governments should be afraid of their people." Ideally, at least, that's the way it should be. Throughout The End of America Wolf, Sundberg, and Stern create an intelligent but cold slap in the face, urging the populace to try and stand up like patriots in order to take back those vanishing freedoms, before it's too late. Depending on which side of the fence you're on, Wolf may either be spot on with her claims, or simply doing a scared Chicken Little dance for the paranoid masses. And wherever you fall, it doesn't matter, because this is one of those films that everyone should see. There's no grandstanding here, just a discourse on a serious topic. Unlike the rabble rousing vitriol of conspiracy master Alex Jones (who even I sometimes think goes a bit too far), Wolf is almost calming in her presentation. While she's certainly passionate about the subject, and she raises a lot of red flags, she does so with the notion that we can somehow fix this perceived mess. If we wake up, that is. Sundberg and Stern give Wolf a wide open berth here, and The End of America is likely one of the scariest films of 2009. Especially if your airline boarding pass is marked with an SSSS. Image Transfer Review: The 1.78:1 anamorphic widescreen transfer is a mixed bag, alternating between good and average, depending on the source material. The town hall portion, with Wolf speaking before an audience, is the strongest, with the bright red of her dress looking especially vivid. Interview segments, however, don't carry the same level of color richness, and the archival news footage often looks the worst. Audio Transfer Review: The 2.0 stereo audio is largely ordinary and suitable, but does have an issue that is difficult to overlook. When Wolf is onstage or anyone is being interviewed, voices are well-mixed, but when Wolf's voice is used as a voiceover, the volume level drops dramatically. This necessitates constantly adjusting the volume, and is something of a inconvenience. Extras Review: The only extra on Disc 1 is a commentary track from Professor Walter J. Murphy, a celebrated Korean war hero and distinguished constitutional scholar. There are quite a few long (I mean l-o-o-o-o-o-n-g) silent periods in Murphy's track, but when he does speak, the content is intelligent, offering a smart educational background to the documentary. His concern that as a nation we're "not out of the woods" with Obama prevents Murphy's track from simply being a Bush-bash, and I only wish he had spoken more often. The film is cut into 12 chapters, and doesn't feature any subtitle options. Disc 2 features over two hours of supplemental material, beginning with a block of extra/extended interviews (all in black-and-white) with Gen. James Cullen (15m:57s), Daniel Ellsberg (17m:37s), Vincent Cannistraro (15m:43s), Eric Lichtbau (08m:28), Mike German (15m:04s), and David Antoon (11m:28s). The idea seems that these were originally shot for the film, and removed for timing/pacing reasons. The content, especially from Ellsberg and German, is worth a viewing. A Conversation With The ACLU (10m:53s) is an interview with executive director Anthony Romero, in which he praises Wolf's book and speaks about what the ACLU is all about. The Hamptons International Film Fest Premiere (16m:12s) covers the film's debut in October 2008, and the image quality ranges from fuzzy to clear. We hear Wolf speak to the audience, and she brings along Alec Baldwin just to make things a bit more incendiary. Targeting Minorities (03m:07s) looks at how "brown skinned Americans" have been targeted since 9/11. Since the film was originally released before the November 2008 elections, included is the original call-to-action pre-election ending (:42s), as well as a new post-election update (02m:02s) that actually manages to offer a little hope. The End Of America could be the scariest film I've seen in some time. It showcases Naomi Wolf and her well-documented belief that the U.S. government has subverted the Constitution for its own unbridled power, in favor of a sweeping elimination of individual rights, as well as an ugly match up to some of history's most heinous dictators and fascists. The level of policy changes Wolf cites�and how they relate to her ten warning signs�are absolutely frightening. This two-disc set contains over two hours of additional interviews and content, but there is a single disc version available also. Take your pick, but find this film and buy it/rent it/borrow it/get it from the library.